The Phoenix Business Journal announced its 2014 Class of 40 Under 40 this week and confirmed that Grand Canyon University’s Maria Quimba will be among the honorees introduced during the newspaper’s annual event in June. The honor places the 37-year-old assistant dean of GCU’s College of Nursing and Health Care Professions among the most prominent businesspeople and entrepreneurs shaping the Valley’s future. At GCU, Quimba oversees strategic academic growth and development for more than 6,200 students across four campus locations and 46 affiliate sites in 27 states. As the nursing dean over professional studies, Quimba supervises the RN-BSN, health science and healthcare administration undergraduate programs taught by nearly 450 GCU nursing and healthcare faculty at the Phoenix campus and online. This year’s 40 Under 40 includes ‘entrepreneurs, lawyers, technology developers, community organizers and others who dedicate their time to innovating sustainable ways to solve Phoenix’s greatest challenges. The same could be said for Quimba, who since joining GCU in 2007 has helped the University develop key partnerships with hospitals and healthcare companies to provide real-world experience to the next generation of nurses and healthcare professionals. That future dynamic could include pairing nursing students with engineering or computer science students on projects like genetic mapping, for example. GCU emphasizes technology in its healthcare curricula and prepares its students for a future focused on personalized healthcare. 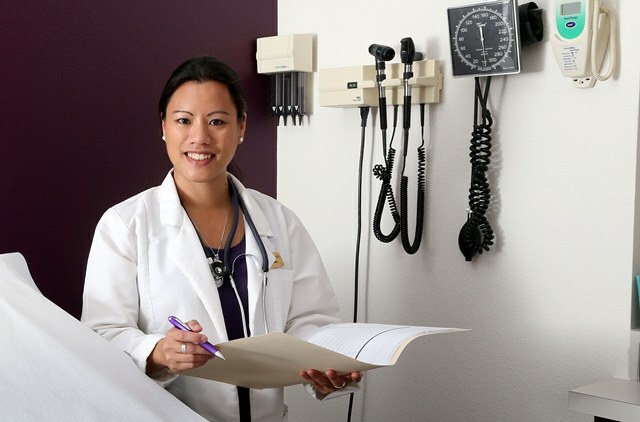 Quimba said she’s dedicated to preparing nursing students for their next degrees and first jobs, but also to ensure that they understand the power of compassionate care — a foundational value of GCU’s nursing programs that applies to nearly 100 niche disciplines represented in University healthcare academic programs. Teaching bedside manners is more of a core obligation for Quimba than a line item in a syllabus. “For me, empowering the next generation is really important because that’s not only the future of our country, but our profession and our discipline,” she said. In addition to her academic leadership at GCU, Quimba spends her free time helping the less-fortunate at St. Vincent de Paul, women victimized by domestic violence, men suffering from mental illness and women preyed upon by human traffickers. She’s also earning her Ph.D. in nursing education from University of Northern Colorado, adding that credential to her three master’s degrees and other academic accolades. Dr. Anne McNamara, dean of the College of Nursing and Health Care Professions, described Quimba as a tireless perfectionist who enjoys serving as a mentor to both students and other GCU faculty. “When she takes something on, she really takes it on and does the deep dive to become an expert at it,” said McNamara, who helped bring Quimba to GCU about seven years ago. Click here to view a list of this year’s 40 Under 40 honorees and more information about the June 26 event. Quimba is also a regional finalist for the 2014 Nurse.com Nursing Excellence Gem Awards, which honors outstanding nursing leaders across the country. That award ceremony is also in June.